Located only five minutes drive from Danesfield House Hotel and Spa is moored Danesfield’s luxury charter motor yacht ‘Sheer Waters’. Enjoy a jaunt down the River Thames indulging in a glorious afternoon tea, a lazy picnic lunch or an indulgent champagne cruise to Henley, Marlow or beyond. ‘Sheer Waters’ is a very spacious craft with two large open sun decks both fore and aft. With two helm positions access from the rear deck provides a large open plan teak lined interior with plenty of seating around two large dinettes. Cruising is available between Maiden Road, Cookham, Marlow, Henley and beyond. To book or for more information please contact reservations on 01628 897 607 or www.danesfieldhouse.co.uk/. In the Cliveden Boathouse on the River Thames, you will find a lovingly restored flotilla of vintage launches. A jaunt down the River Thames in one of these exquisite treasures, whether for a glorious afternoon tea, a lazy picnic lunch or an indulgent champagne cruise to Henley, offers the ultimate in sheer effortless enjoyment. The most luxurious boat trips on one of the most beautiful stretches of the Thames you can imagine. ‘The Suzy Ann’, built in 1911, and celebrating her 100th year in 2011, is the flagship and can accommodate up to twelve guests in great style and comfort. Restored for Cliveden in 1986, Suzy Ann subsequently won first prize for best professional restoration of a vintage boat at the Henley Traditional Boat Rally. ‘Belmont’, a resplendent 33 foot Thames slipper launch, can entertain up to four guests. Built in the 1930s, she’s been painstakingly restored and is a most divinely extravagant way to cruise the Thames. In the 1920s, Lady Astor also commissioned her very own Thames electric canoe, the ‘Liddesdale’ – capable of accommodating up to five guests. It is totally silent so you can enjoy the river in all its tranquillity. Cliveden is very proud to have brought the restored Liddesdale back to the Cliveden Reach. CHAMPAGNE CRUISE ON THE THAMES At 5pm and 6pm each evening you can board one of their beautiful launches and sail along the Cliveden Reach while sipping Champagne in the evening light. £47.00 per person (April to October). For further information or to make a booking please contact 01628 668561 or email reservations@clivedenhouse.co.uk. Cruising the Thames doesn’t come any more relaxing than when you hire one of the hotels private launches and explore the upper Thames under the expert eye of an experienced skipper. Sit back, sip a glass of Champagne and enjoy the tranquility of the River Thames and all the local historic views. April to October. Tresanton is a cluster of houses on the edge of St Mawes, one of the prettiest fishing villages in Cornwall. Originally created as a yachtsmen’s club, in 1997 Olga Polizzi bought Tresanton and spent two years completely redesigning and restoring it. All rooms have stunning views across the sea towards St Anthony’s lighthouse. In addition to 30 rooms the hotel has a private yacht, ‘Pinuccia’ a magnificent 8 metre classic yacht. 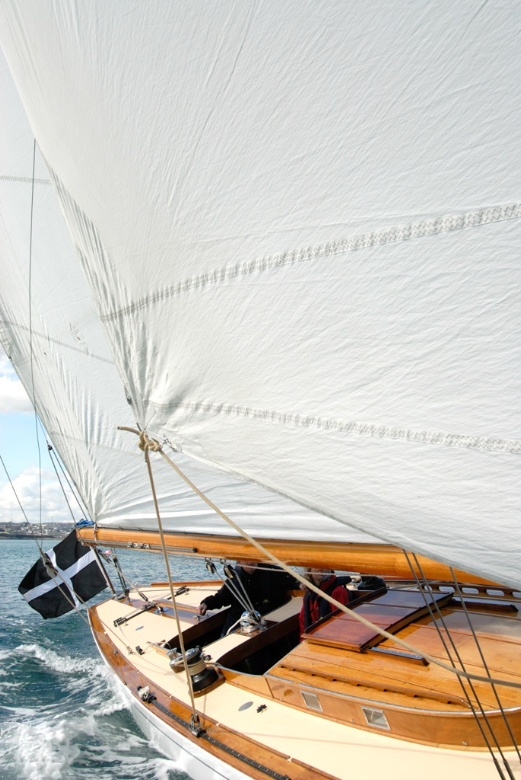 She was built in 1939 to race for Italy at an international competition and is the most beautiful boat in St Mawes harbour, with her slender line and tall wooden mast. From Easter to the end of September, the Tresanton skipper will take you sailing around Falmouth bay. This area, which includes the estuary of the Helford and the Fal rivers, is one of the most beautiful and safe areas for sailing and boating in Britain. If you prefer a shorter and faster sightseeing tour of Falmouth bay, they also have a speedboat. Just ask the skipper to take you on the rib to one of the many secluded beaches nearby. £600 per day for a whole day sailing including a picnic for two and a bottle of pink prosecco or a picnic for four and a bottle of house white wine. £330 for a half day sailing from 10am to 1pm or from 2pm to 5pm. £350 for an evening sail including a bottle of house wine from 5.30pm to 8.30pm. Your opportunity to take a trip on their 1920′s River Launch, ‘Lady Sophina’, an immaculate varnished mahogany and teak boat with original brass fittings. Enjoy a Champagne Cruise along some of the most beautiful stretches of the Kennet and Avon Waterway aboard this stunningly beautiful craft. Prices start from £405 per night during the week, with a supplement of £80 on weekends. This special break is available until 30th September 2013. Subject to availability. This offer is based on double occupancy. There will be a maximum of six passengers per Cruise. For Exclusive hire of Lady Sophina please contact 01225 823333 or go to http://www.royalcrescent.co.uk/. Member benefits are available at all of the above hotels – please click here for details or for further information on how to join Design Restaurants Dining Club. Liddesdale is no longer available for charter. She is now in the care of the National Trust at Cliveden and funds are being raised to restore her hull and fit new batteries. She is displayed out of the water in the ‘Gas Yard’.